THE BLAST OF BUZZ SAWS in Sheridan Circle made me hurry there, expecting the worst. 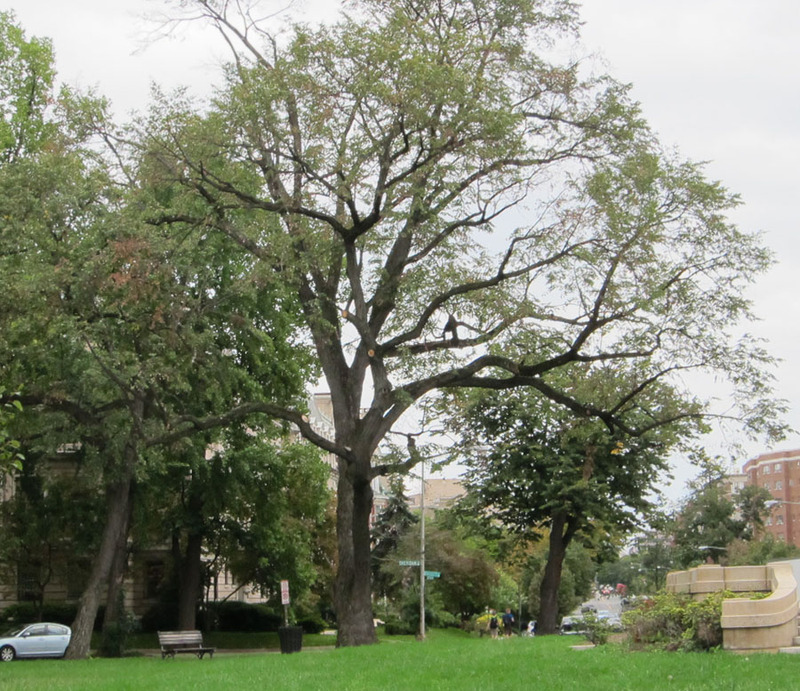 The noise came from someone in a cherry picker, high in the branches of possibly the most remarkable historic tree on Embassy Row. In the surrounding lawn of Sheridan Circle lay piles of fat logs; clearly the job under way was part of the Park Service’s maintenance of the area. “No cutting down, only pruning,” the work crew told me. But it takes just an hour for a well-equipped crew to massacre a century ‘s worth of slow tree growth. I asked the crew to stop while I contacted the company, GreenTree. The dispatcher put me in touch with the Park Service supervisor; he was nearby and came over. He too said the job was “only” pruning and that the tree’s lovely form would stay intact. So: how well did GreenTree prune the tree? 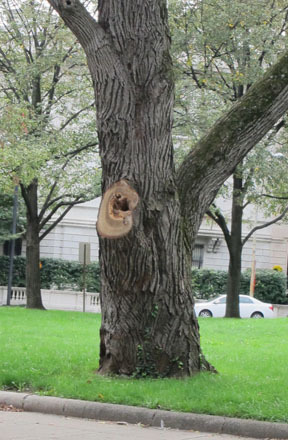 What makes this tree historic and newsworthy? It was likely a mistake! This tree’s low, curving branches suggest it is a Crimean linden (Tilia euchlora) that branch near the bottom; they are different from straight-trunked lindens such as American linden (Tilia Americana). 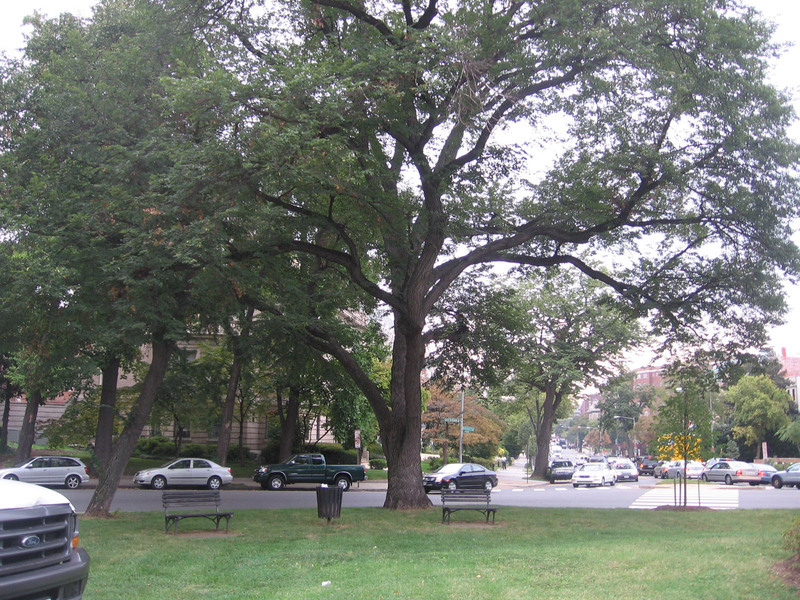 After the Civil War, the city’ horticulturalists who turned muddy Washington into the “City of Trees,” used one species on a street or monoculture. They chose the American linden for Mass Ave, to make it better than Berlin’s famous grand avenue, Unter den Linden. News accounts and city engineers’ reports show that this one species was planted in double rows for four miles across the city. The Washington Post on Sept 4, 1904 wrote that a ”highway” of 500 more lindens would be planted on the new part of Massachusetts Avenue, to make it “Earth’s noblest shaded way.” A typical later account two decades later was a news story of the writer’s trip, from Union Station to beyond Sheridan Circle, under the fragrant canopy of linden blossoms in June. 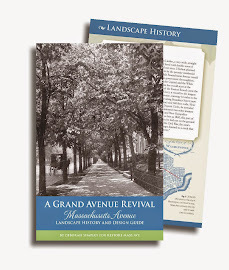 The linden rows of Berlin were “a disappointment” compared to Mass Ave. The rows were always reported to be of American lindens. If this Crimean linden was an error, it was a spectacular one! Knowledge Trees has helped Metropolis property owners reassert their greenery in the confronting of rubbery season droughts and devastating storms. Consider it may be too dead to preclude a histrion? Using professional-grade City actor conjugation solutions, your genre can melody in less-than-ideal conditions. I loved this post! You have such awesome content! Thanks for sharing them. Keep posting!!! !